At the time of the interview, Naomi was performing as the aspiring opera singer Sharon Graham in Terrence McNally’s Master Class at the Vaudeville Theatre. 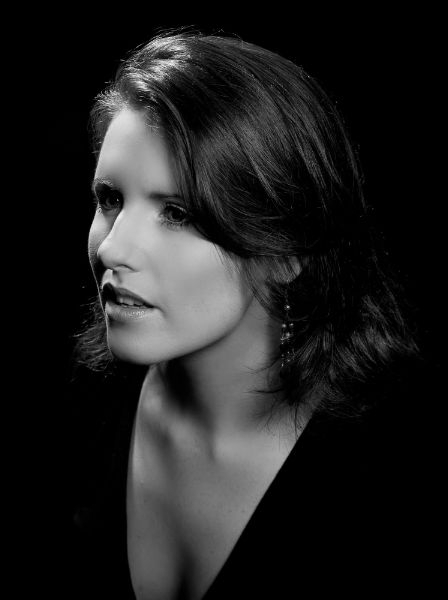 Graduating from the Royal Irish Academy of Music in 2008, Naomi then studied at The Juilliard School in New York. She won the Juilliard Vocal Arts Honors Recital with her good friend and brilliant pianist Brent Funderburk. Their prize was a joint recital at Alice Tully Hall, at The Lincoln Center on Broadway. Master Class is Naomi’s West End debut. Earlier this week Naomi took time out from her busy schedule to answer some questions about herself and Master Class. Enjoy! You grew up in County Clare, Ireland. Can you tell us about your childhood there? I would say I grew up in one of the most special places in the world, without realising it at the time. The Burren is a very beautiful place to live. My brother and I grew up free, wild and very happy, speaking both English and German. Which turned out to be a big advantage for me later, when it came to singing as a career. When did you first discover that you had a talent for singing? Well, I think other people discovered it before I did, really. My mother has a tape from when I was two years old singing little nursery rhymes in German with me, which I loved by the sounds of it. Then I had a teacher in primary school – Dympna Hyland – who would make me sing solo in our school choir, when my voice would shake like a leaf from being so nervous. (An interesting circle happened there – Dympna went to college with Mary Brennan, who would later become my teacher when I went to study music in Dublin, and they are still very good friends. Small world!) But I suppose I first realised it myself after a term or two of singing lessons with my first teacher Archie Simpson. I was 13 or 14 and I can’t describe it properly but it’s as though my life turned suddenly Technicolor. I loved my lessons – they were the best part of my week and it felt so natural to sing, almost like a re-discovery rather than learning from scratch. And I think a discovery like that comes from having a great teacher. Archie is one of the most encouraging, inspiring people I have ever met, so to have him as a teacher was certainly one of the best things that’s ever happened to me. So you began your vocal studies with Archie Simpson and graduated from the Royal Irish Academy of Music in 2008. What are some of your favourite memories from your training? There are just so many great memories I have from those years! I can describe Archie’s living room, where we had our singing lessons, to you in vivid detail – the light, Archie’s face, the sound of the piano, the smell of the sheet music. Generally lessons would overlap and all the students would perform for each other, singing whatever song we were learning that week. That felt like home to me. I remember the two days I spent recording a Christmas album when I was fifteen with Archie and Roy Holmes, another mentor of mine. We had a beautiful grand piano delivered to the lecture hall at the Burren College of Art and spent two long days recording eighteen tracks altogether, I think. It’s so lovely to have that now – it was still a child’s voice at that point but you could hear the little bits of colour creeping in that would become my sound. In Dublin, I remember being in college in Lieder class that was led by my teacher Mary, sitting and listening to students performing all of this wonderful music – Schubert, Strauss, Wolf, Mahler and being utterly enthralled. Learning about tempo, how to keep a song moving, how to paint the words with your voice, how to spin out a note with a certain colour. I have been truly blessed with teachers all along the way – in college Mary and Mairead Hurley, my repetiteur, taught me so much. About language, programming and vocal colour and the detail that must go into a song. And of course, I remember being nervous for big competitions and performances – not sleeping, feeling terrified, sometimes throwing up. But it’s all a learning curve. A mate of mine says it’s as though you make friends with it. Nerves never go away but you learn to deal with them differently. While studying at The Juilliard School in New York, along with Fiona Kelly and a colleague you set up a group called The Larks in The Clear Air. Can you tell us about that? We set up “The Larks in the Clear Air” as a chamber music group with flute, voice and piano in order to promote the Irish song literature, of which there is a surprisingly vast repertoire. The less well-known songs are not performed outside of Ireland often and we wanted to change that, bringing songs of both older and younger generations together in a program that reached out to people on a personal level. There is heart and soul and humour in the Irish song literature; it’s some of my favourite music to perform in recital. Along with your flatmate Fiona Kelly, you were two of the very few Irish students at Juilliard. How did you ‘fit in’? Like a glove! In fact, when I first came to Juilliard there were two more Irish students there – Paul Sharp and Jessica Costelloe. Needless to say, all four of us became very close friends. Paul and I were joined at the hip for the two years of our Masters Degree and then he left New York for London. So I’m delighted to be living in the same city as him again for this job! But, you know, New York is such a melting-pot of nationalities, I always felt welcomed and at home there. And Juilliard is a lovely place – very warm and full of wonderful people. We all made a lot of friends there. Can you describe your Lincoln Center debut at Alice Tully Hall in 2010? That was one nerve-racking night, I can tell you! I won the Juillard Vocal Arts Honors Recital with my good friend and colleague Brent Funderburk, a wonderful pianist who just graduated from Juilliard last year. Our prize was a joint recital at Alice Tully Hall, which is a wonderful, big concert hall at The Lincoln Center. We planned our program of Duparc, Mahler and Irish songs and rehearsed until the cows came home before this recital! We both put so much work into it and to walk onto the stage at Tully Hall, greeted by the cheers of all our colleagues at school was a very special moment. You have performed in various iconic venues in Europe and in the US. What have been some of your favourite venues? It’s all about acoustic and atmosphere, I would say, so at the top of the list would probably be Alice Tully Hall in New York. I really enjoyed singing at St. Giles’ Cathedral in Edinburgh one New Year’s Eve and in Ireland, I loved St. Patrick’s Cathedral where I performed Elgar’s “The Music Makers” with the Trinity Orchestra. The strangest place was possibly the European Parliament at Strasbourg. And of course, smaller venues have another kind of charm to them. In Co. Clare, there is the most gorgeous church in Ruan, where we recorded the Lismorahaun Singers album. Small, beautiful and a glorious acoustic. You were the First Prize Winner of the 2011 Concert Artists Guild Victor Elmaleh Competition, and also First Prize at the Altamura/Caruso International Voice Competition. How important is it to you to have your talent recognised in this way? You know, even at the best of times, singing competitions can be high-pressure, high-stress events if you look at them in a certain light. However, these two particular competitions, though high-pressure, were really such a joy to be a part of and it means a lot to me to have been awarded first place in them. The Altamura/Caruso Voice Competition included competitors from Europe, Canada and the USA so I was bowled over when I won. The Concert Artists Guild is an organisation that finds and promotes young musicians, giving them management and opportunities to perform in venues throughout the United States. Truly wonderful! For me, it means an opportunity to perform in recital on a regular basis, which is fairly unusual for a singer just out of school – usually you have to find your way in opera first. I love to be on the recital platform; Brent and I have a great musical partnership and the next few years are going to be a lot of fun performing throughout the USA together. Critics hailed your performance as “evocative, appealing and expressive” in The New York Festival of Song in their ‘Roadtrip’ concert at Alice Tully Hall. What did you enjoy most about the festival? The Roadtrip concert was, in a word, epic! The New York Festival of Song was founded by two pianists, Steven Blier and Michael Barrett. Steve is a mentor of mine and to work with him on this concert, along with my colleagues from Juilliard was an adventure. The concert took the form of a musical roadtrip around America, starting in New York and ending in LA. What I enjoyed most about it? I suppose it was finding a part of my voice that was not operatic, not even necessarily classical, but honest and clean enough to perform songs such as Randy Newman’s “Dayton Ohio, 1903”. People sometimes ask me after they hear me sing opera – “Cool, but can you sing normally as well?” Which, of course, is funny but there’s a truth in it too. All of these folk songs and popular songs don’t necessarily need that operatic colour, so to find that style without the “classical” sound can be intimidating. Karaoke for instance, TERRIFIES me. Though I did have a go at Guitar Hero over Christmas and I may be conquering my fear. Slowly. You are currently appearing as Sharon Graham in Terrence McNally’s Master Class at the Vaudeville Theatre. What can you tell us about your role? Sharon is a young, aspiring opera singer who I believe wants nothing more than to impress Maria Callas with her singing. So, I’m not going to give anything away here for those who haven’t seen the play yet, but let’s just say that things don’t go exactly as she planned they would. The personality clash is terrific! It is such fun to play and with the whole cast and production team as lovely as they are, it’s going to be a great few months, I can tell! What in particular attracted you to this role and what was the auditioning process like? This is my first professional job after leaving Juilliard and I have to say I couldn’t have asked for a better experience! Stephen Wadsworth, our director, has been my acting teacher in New York for the past two years so to work with him on this is a gift – and I am learning so much every single day. The audition itself was actually a lot of fun – which is something we all worked on in the Artist Diploma program at Juilliard – making the audition process fun, which is harder than it sounds! What was also interesting to me was learning to sing this aria, written for a dramatic Verdi soprano, and finding new colours and abilities in my voice that I didn’t know were there, with my voice teacher in New York, Dr. Robert White. The invisible fourth wall is broken down in Master Class. As a performer how do you cope with that? In some ways it’s easier, as your reaction onstage will be somewhat determined by the audience response. It certainly keeps you on your toes! Also, it adds the reality of the master class situation – standing up and performing in front of a room full of people – that is so important to the play as a whole. I love hearing the different ways in which the audiences respond to it night by night. Why should everyone go and see Master Class? Two words – Tyne Daly! She is electric in this role as Maria Callas – I’ve never seen anything like it before. She is moving, arresting, funny, phenomenal. Not to mention, the rest of the cast is wonderful as well – you have two great actors already well-known on the West End scene – Dianne Pilkington and Gerard Carey – and two fantastic performers from the Broadway production – Garrett Sorenson and Jeremy Cohen. All gorgeous people in real life too, by the way! On top of that, this play speaks about art, artistry, music and life. There is a truth to Terrence McNally’s writing that hits home in a big way. It will make you laugh, it will make you cry and it will give you something to think about. And it’s rip-roaringly funny too. Master Class has a limited run until April 2012. What plans do you have for later this year? In June I make my debut with Garsington Opera as the title role in La Périchole, an operetta by Offenbach, which I am very much looking forward to! It’s a wonderful piece and Périchole is a fantastic character to play – full of life, charm and wit. Following that, I am heading to Vermont to the Marlboro Music Festival for my second summer there – rehearsing and performing chamber music with some of the finest young musicians from around the world. It was great to be a part of it last year so I can’t wait to go back. Following that, I have a few recitals coming up in New York, including my Carnegie recital debut at Weill Hall in March 2013. What advice would you give to any young performer considering a career in the arts? Strive to be the best that you can be at what you do, but know that you are enough – just as you are. It’s not always easy but if you have found something you love, just work hard, go for it and ENJOY THE JOURNEY! What do you like to do on a day-off from performing? Laundry! And I love to watch movies, take walks, see friends, have a long and slow morning, do some yoga maybe if I’m feeling very inspired to be good, check out a new café or a bookshop. But I am also determined to see London properly and go to a few museums while I’m here. My mother will disown me if I don’t get some culture into me! Many thanks Naomi for a great interview and best wishes for Master Class and the future! naomi wow! so blessed and wise. sincere congratulations!! I would like to wish you ongoing sucess but most of all enjoyment for every day along your path-.no matter if it is doing laundry,or rehearsing, remembering the burren or singing and performing on stage.skylark.